With the success of Hero Honda Pleasure with the punch line “why should boys have all the fun?” and after the separation from the automobile giant HONDA, Hero is all set to launch its new scooter, Hero MAESTRO. A 109cc scooter from Hero MotoCorp which looks similar to the Honda Activa and had reveled in Auto Expo 2012.The new MAESTRO is powered by a 109cc Advanced Swirl Flow Induction System (ASFS) single cylinder engine which increases the efficiency of the vehicle, power delivery, seamless acceleration and that provides a max power of 8.2 Ps and max 9.10 Nm torque. Hero Maestor comes with Combined Braking System which you find in Honda vehicles. The new Combined Braking System triggers both brakes. When you press left side brake lever, it trigger both front and rear brakes which significanlty reuce the stopping distance. Hero Maestro is provided with an Analogue Digital Console which provides it a new neat look with the additional service indicator which indicates when the vehicle is in need of a service. Hero Maestro is available in Six Different color, panther black met, pearl fadeless white, force silver met, pearl harvest green, candy blazing red and maestro blue met. 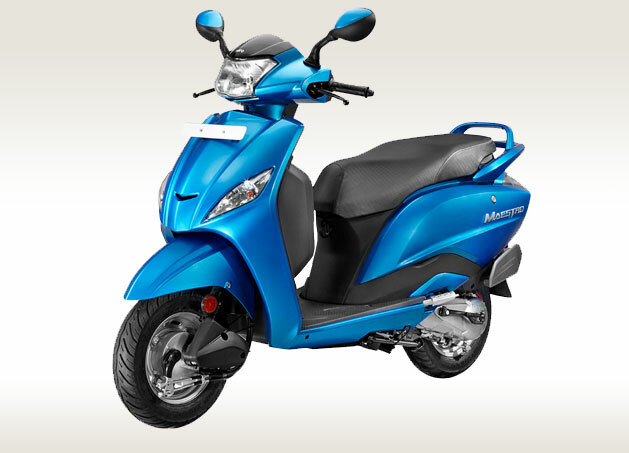 The looks of the Maestro somewhat resembles the looks of HONDA Activa and there are certain chances of comparison of Honda Activa and Hero Maestro.